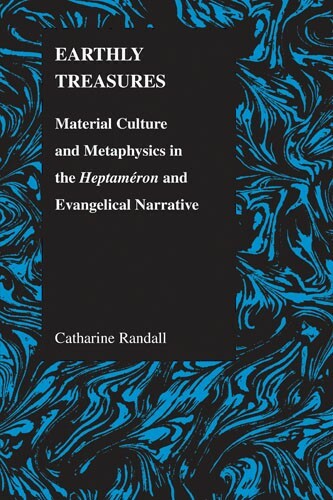 Earthly Treasures maps the presence, position and use in the narrative of a variety of material objects in Marguerite de Navarre's Heptameron. There is a wide selection of objects, ranging from tapestries with scripture passages woven into the borders, fine arts paintings, chalices incised with proverbs, emblems, table linens, copies of Bibles or manuscripts, clothing, masks, stage props, jewelry, furniture and foodstuffs. 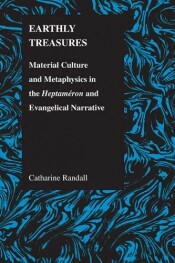 Although the presence of such material objects seems paradoxical, given the scriptural mandate to disregard things of this world, and to "store up treasure", rather, in heaven, Marguerite found license to use such objects both in the Bible and in the daily life-oriented and artifact-studded sermons and writings collected in the Table Talk of Martin Luther. Catharine Randall teaches French language, literature and culture, as well as comparative literature, at Fordham University. She is the author of 5 books and some fifty articles and chapters in books, (and another book manuscript currently under consideration by Columbia University Press on the Huguenots and Camisards in the 17th and 18th centuries). Her professional career has been oriented around exploring the constraints that varieties of Protestantism imposed on writers of particular confessions (such as Calvinism or Lutheranism) as well as the permissions for artistic expression that -- somewhat surprisingly -- may be discerned in those theological systems.